Front Running - What Does It Mean? 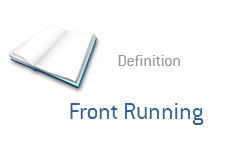 What is "front running"? What is the definition of "front running"? "Front running" is the act of executing a trade (either a buy or a sell) when you have knowledge that a trade or group of trades will shortly follow thereafter. Example #1: You are a broker. A client calls up and says "I need you to buy me 400,000 shares of XYZ right away." You decide that this order will push shares of XYZ higher, so you decide to purchase a position for yourself BEFORE your client's position is executed. This is obviously illegal, as you are using information that is not known to the rest of the investing public to enrich yourself. Example #2: You run a popular day-trading chat room. You purchase shares of XYZ, and then implore your paying customers to do the same. This is illegal, as you are not disclosing your purchase or your intention to sell while they are buying.